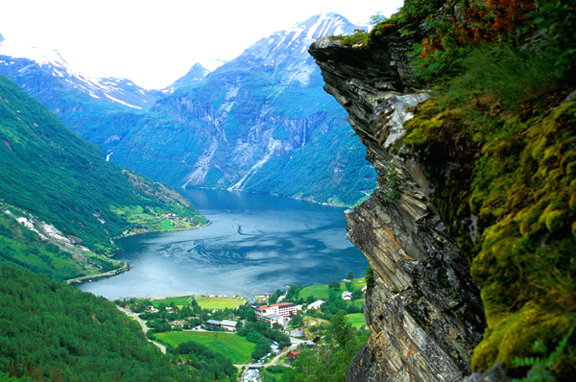 Encore: Geirangerfjord...can you pronounce it? I'm not sure I can pronounce it myself...but I think it's fun to try. Time for another 'place of the day' to highlight - and it's in Norway which has been on my list of places to visit not just for fun (but also for genealogy purposes). The fjords of Norway are always talked about as one of the things to do when you finally get to the country, and this is no exception. You can get to this location by boat, cruise, hike, road, or even bicycle if you're so inclined. The cliff wall itself is over 10 miles long, and is a site to take in. If you do get there and plan ahead, the Union Hotel is a recommended place to stay - Room 12 is where Kaiser Wilhelm stayed no fewer than 25 times in his lifetime. For a map view, click here. You'll most likely fly into Oslo and then take the 7 hour trip via the Serpentine Road to reach the fjord. Flights to Oslo can be found via Europe or direct through SAS or United from the US. British Airways and Delta also connect to there via partners. Mid-August flights from JFK are averaging about $1000 in economy. If you want to use points or miles, business seats can be had in mid-August for 50,000 miles O/W on United via Lufthansa and SAS (in lieu of a ticket price of $2400). It's not tremendous value, but could save you if you're short on cash.